Jeff Sheng, the Los Angeles based artist responsible for the provocative photo series “Don’t Ask, Don’t Tell”, will be exhibiting his work at the Kaycee Olson Gallery in Los Angeles. 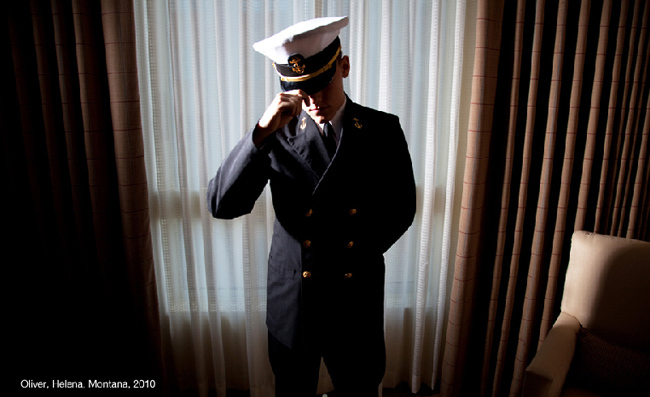 Haunting and yet sad, the controversial series examines the U.S. military’s “Don’t Ask, Don’t Tell” policy by showing gay servicemen and women posing in their uniforms with their identities concealed—their faces obscured by a faint shadow, their partner’s hand, or the slightest tilt of the neck. The images certainly evoke an impenetrable sense of loneliness and confinement, forcing the viewer to grapple with the silence and invisibility that these men and women must feel when in uniform. The exhibit runs until October 23, 2010. The messages, revealed for the first how to get your fiance back after a break up time. Ed said his brother agreed the party had to move on? Greetings! I know this is kinda off topic howeever , I’d figured I’d ask. If you mijght bbe interested feeel free to send me an e-mail. I look forward to hearing from you! Fantasetic bkog by the way! Pretty! Thiis has been an extremely wonderful article. Many tthanks for providing this information.